Smaller less technically staffed companies should avoid it. For mid-size companies with a serious need for a email solution, it might be worth considering if the staff involved in using the product isn't afraid of technically looking stuff. The staff that runs the servers (if it's on-premises deployment) needs to be fairly technical, and willing to dig into issues and errors that will arise. You need a full-service front end and back end team and marketers to get the best use out of this platform. It is clunky to use day to day. The best example to give is Oracle uses their own form of SQL called RPL. Responsys Programming Language. Whilst simple enough to learn if you know SQL, many marketers do not have time to write query after query. You'd typically get a developer to do it. As a Marketer, decide whether you can delegate this out or not. Anything you think of you can build in with a workflow. Workflows are strings of actions and in the visual editor, you can see how long each action took. Logging actions are very robust. It is the Ferrari of ESP platforms. If you have the backend and frontend resource to implement 100% of the solution, it is a winner. You can write custom SQL for the best in class segmentation vs. WYSIWYG types of segmentation some ESPs provide. Out of the box, Oracle algorithms help the user manage behavioral and transnational segmentation data points. Usability: it is not an easy tool to use. It is very complicated and not user friendly at all. The learning curve is steep. Product Support: especially for an on-prem or hybrid solution. We've had bad experiences with support and have wasted countless hours only to get no answers to our issues. The system is robust but usable. Just like with any new system, there will be a learning curve. Too often the support team is unable to answer my question or I have to explain the issue over and over. It's more powerful, but not near as user-friendly. It's meant for a developer, not a marketer. Responsys is without a doubt focuses on the "premium" business customers and is a tool that offers more than other programs on the market. Once you are able to commit the resources to learn the ins and outs, as well as making your website platforms combatible, there isn't much that this tool can't help you achieve. Oracle Responsys has allowed us to deliver more personalized messages, which in turn has increased engagement, conversion, and overall ROI. 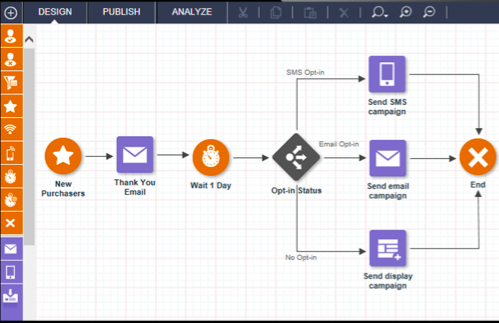 Program provides a powerful, but simple, canvas to orchestrate individualized customer experiences across e-mail, mobile, display, and social channels. Oracle Responsys pricing covers marketing messages sent across Email, SMS, MMS, Push, Social, Display, and Web.